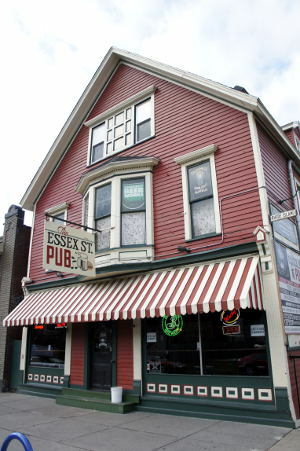 The history of the building goes back to 1883 when it operated as a brewery, then a luncheonette, a diner/mob hang out, restaurant, deli and in 1986 the Essex Street Pub was born. 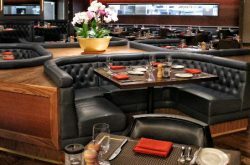 The current owner Macky bought it in 2011, now called Macky’s Essex Street Pub – he remodeled, got the food thing going and promises to “bring the deliciousness to your table”. According to their website the kitchen is always open until 1:00 a.m. and the bar is always open until 4. 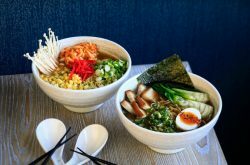 Plus, they’re currently on the City Dining Cards App. Good to know! 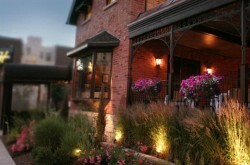 Looking for the odd little joint that has character and of course good eats and drinks? Sure you are. Step away from the chain burger joint, move off the same ole, same ole. 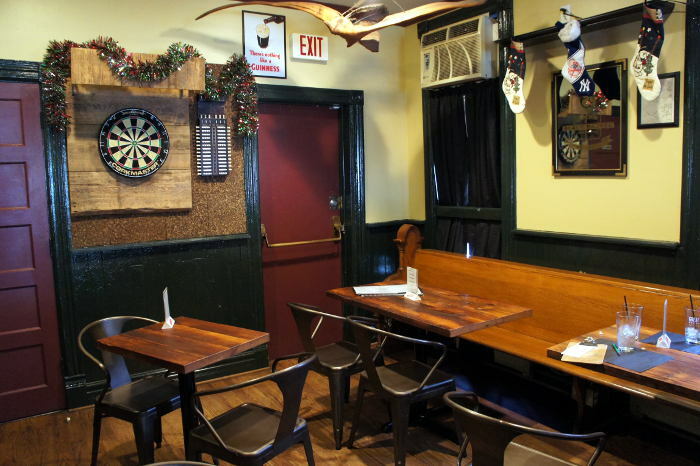 The Essex Street Pub is a fantastic little hidden gem on the edge of the west side. Full of charm and perfect for lunch, dinner or late night munchies, and plenty to drink too. They’ve got Burgers – the theme here is 1/2 pound with five to choose from. Craving BBQ? – chicken ribs, brisket, pulled pork and even a veggie plate. (They have their very own smoker in the kitchen.) Apps include a couple salads, Hickory smoked wings, chili and some nachos. Five options of burritos including beef brisket and smoked BBQ chicken and black bean. Six choices of “sammiches” including pastrami and two veggie options. If you haven’t been you’ve probably passed by plenty on your way to some other better known stop. Sort of a bar with a mini burger/BBQ joint on the side. 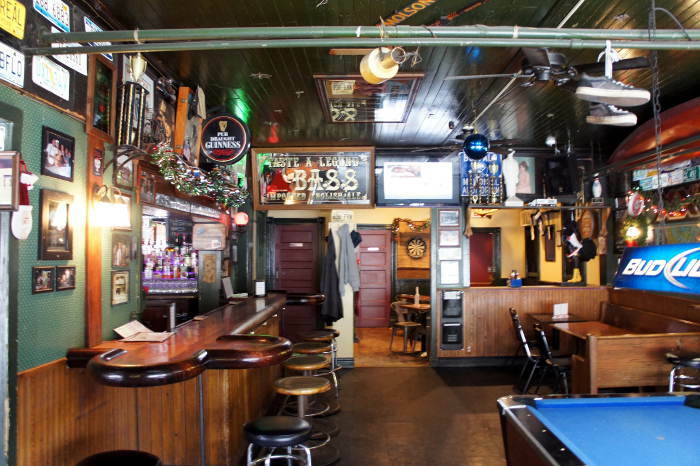 The place is the classic little pub with plenty of personality and peculiar paraphernalia. My personal favorite is the three foot rooster with the Elmer Fudd cap – the goalie sticks on the ceiling running a close second. With wood plank ceilings, and slightly drooping, worn tile floors it has the comfortable patina that only comes with age. Large windows look out to Rhode Island Street past a pool table and a stripped awning. 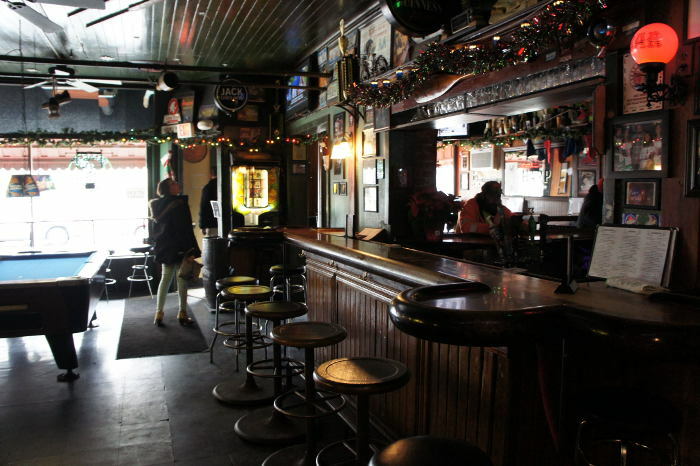 Macky’s Essex Street Pub can get a tad noisy some nights. On this occasion we stopped for a reasonably quiet lunch on a Friday afternoon. You can always tell a good spot when everyone at the table is enjoying their own dish while eyeing others’ with envy. Thankfully we share. 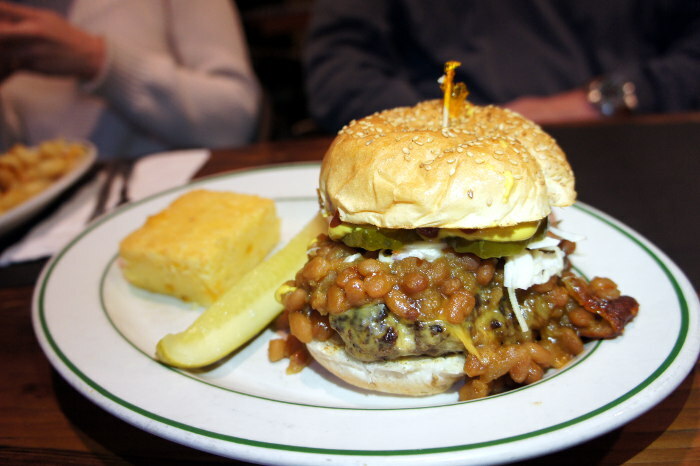 Picnic Burger $12 – Half Pound Beef Patty Flat Grilled, American Cheese, Smokey Baked Beans, Coleslaw, Ketchup, Mustard, Sweet Pickles. With a side of the cornbread. Truthfully, I didn’t realize that the beans and slaw came on the burger. It’s a good thing too because I might have said something stupid like “can I have those on the side”. Loved it! Burger big, fat and cooked to a perfect medium rare. 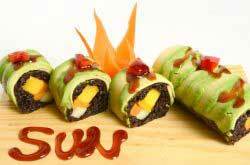 There is just something inherently fun about exploring novel food combinations. You can get various additional toppings on your burgers like MacDaddy mac-n-cheese, Caramelized Onions, Pickled Jalapeños, Bacon, and Crisped Pastrami for a small fee. Nickel City Reuben $14 – Hickory Slow-Smoked Pastrami, Mack’d Out Kraut, 1000 Island Dressing, Marble Rye and Deli Swiss. With a side of MacDaddy Mac n cheese. I’m not sure what Mack’d Out Kraut means, but I do know that this was awesome. Maybe the kraut, maybe the pastrami, definitely good stuff. The mac was nice – rich, creamy and tasty. 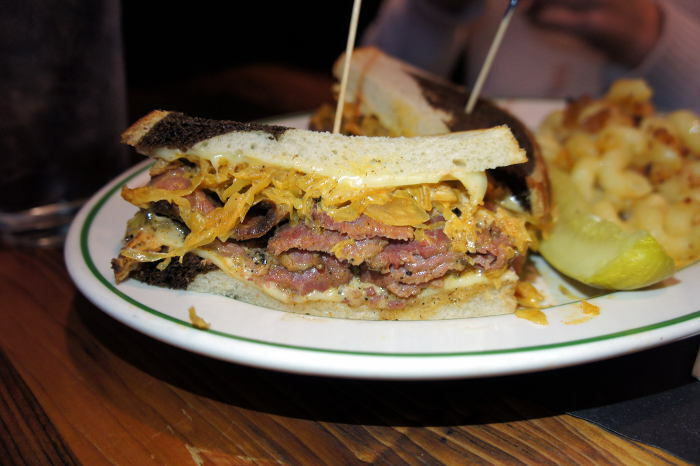 The words “best-ever reuben” may have been uttered more than once. 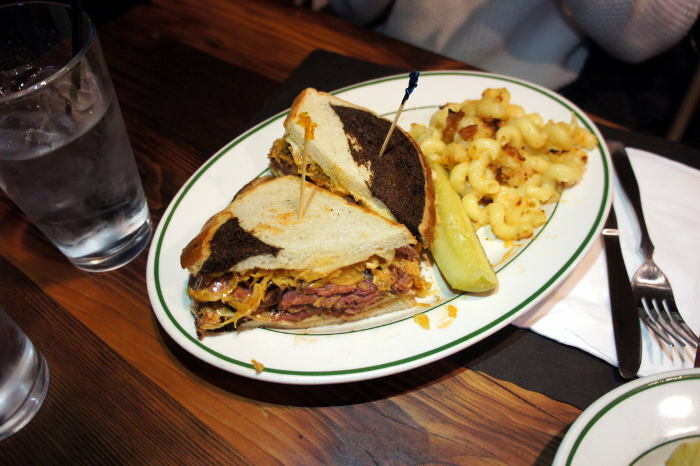 I’d make a trip to Essex Street just to try this if you’re at all into pastrami. 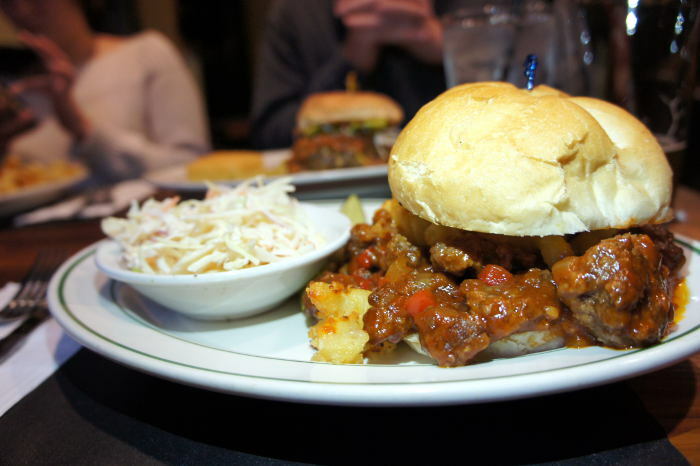 Macky Joe $10 – Half Pound Sautéed Beef, Signature Sloppy-Sauce, Mac Daddy Mac ‘n Cheese, Costanzo’s Roll. With a side of Coleslaw. A blast back to childhood, if you like a good Sloppy Joe, not from the can, this is your pick. Plenty of beef, veggies and tomato, with your two childhood favs. That’s right, the mac ‘n cheese comes ON the sandwich. If they could only get tomato soup in there somehow. The slaw was excellent – fresh and not too mayonnaise-ish-y.